Last month, after the WannaCry ransomware attack infected 230,000 computers in 150 countries, the US Department of Health and Human Services (HHS) Office for Civil Rights (OCR) issued a “Quick-Response Checklist” for HIPPA covered entities and business associates to follow when responding to a ransomware attack or other “cyber-related security incident,” as that phrase is defined under the HIPAA Security Rule. 45 C.F.R. 164.304. Execute the response and mitigation procedures and contingency plans. Entities should immediately fix any technical or other problems to stop the incident and take steps to mitigate any impermissible disclosure of protected health information (either done by the entity’s own information technology staff, or by an outside entity brought in to help). Report the crime to other law enforcement agencies. This includes state or local law enforcement, the FBI, or the Secret Service. The OCR makes clear that any such report should not include protected health information (unless otherwise permitted by the HIPPA Privacy Rule). Report all cyber threat indicators to federal and information-sharing and analysis organizations (ISAOs). A cyber threat indicator is defined under federal law as information that is necessary to identify malicious cyber activity. The US Department of Homeland Security, the HHS Assistant Secretary for Preparedness and Response, and private-sector cyber-threat ISAOs are all identified as acceptable information-sharing organizations under the new checklist. The OCR, however, makes clear that it does not receive reports from its federal or HHS partners. 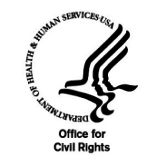 Report the breach to OCR as soon as possible, “but no later than 60 days after the discovery of a breach affecting 500 or more individuals.” Entities should notify “affected individuals and the media unless a law enforcement official has requested a delay in the reporting.” The OCR also presumes that all cyber-related security incidents where protected health information was accessed, acquired, used, or disclosed are reportable breaches unless the information was encrypted by the entity at the time of the incident or the entity determines, through a written risk assessment, that there was a low probability that the information was compromised during the breach. An entity that discovers a breach affecting fewer than 500 individuals has an obligation to notify individuals without unreasonable delay, but no later than 60 days after discovery. And the OCR must be notified within 60 days after the end of the calendar year in which the breach was discovered. In the end, the OCR states that it considers “all mitigation efforts taken by the entity during any particular breach investigation,” including the voluntary sharing of breach-related information with law enforcement agencies and other federal and analysis organizations, as outlined in the checklist. The OCR’s checklist makes clear that preparing for, and responding quickly to any potential breach should be a priority for HIPPA covered entities and their business associates. This includes preparing or updating enterprise wide incident response plans, training leadership, implementing effective governance programs, and having the ability to rapidly mobilize a response to malicious activity. Dentons’ global Privacy and Cybersecurity Group, in conjunction with Dentons’ leading healthcare practice, has extensive experience helping entities prepare and execute such plans and dealing with the rapidly changing legal and regulatory landscape that emerges in the aftermath of a security incident. 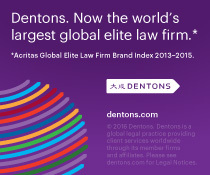 Dentons is the world’s largest law firm, a leader on the Acritas Global Elite Brand Index, a BTI Client Service 30 Award winner, and recognized by prominent business and legal publications for its innovations in client service, including founding Nextlaw Labs and the Nextlaw Global Referral Network. Dentons’ global Privacy and Cybersecurity Group operates at the intersection of technology and law, and was recently singled out as one of the law firms best at cybersecurity by corporate counsel, according to BTI Consulting Group. On May 15, 2017, the US Government Accountability Office (GAO) released a new report entitled “Internet of Things: Status and implications of an increasingly connected world.” In the report, the GAO provides an introduction to the Internet of Things (IoT), describes what is known about current and emerging IoT technologies, and examines the implications of their use. The report was prepared by reviewing key reports and scientific literature describing current and developing IoT technologies and their uses, concentrating on consumers, industry, and the public sector, and interviewing agency officials from the Federal Trade Commission (FTC) and Federal Communications Commission (FCC). The GAO also convened a number of expert meetings during the drafting process, bringing together experts from various disciplines, including computer science, security, privacy, law, economics, physics, and product development. Miniaturized, inexpensive electronics. According to the GAO, the cost and size of electronics are decreasing, making it easier for the electronics to be embedded into objects and to be enabled as IoT devices. For example, the price of sensors has significantly declined over the past decade. One sensor called an accelerometer cost an average of $2 in 2006. The average price of the unit in 2015 was $.40. Ubiquitous connectivity. The GAO notes that the expansion of networks and decreasing costs allow for easier connectivity, and for IoT devices to be used almost anywhere. The proliferation of Wi-Fi options and Bluetooth creates a more expansive space for IoT to operate. Cloud computing. Cloud computing allows for increased computer processing. Because IoT devices create a large amount of data, they require large amounts of computing power to analyze the data. The increase and availability of cloud computing is helping IoT devices expand. Data analytics. New advanced analytical tools can be used to examine large amounts of data to uncover hidden patterns and correlations. According to the GAO, advanced algorithms in computing systems can enable the automation of data analytics, and allow for valuable information to be collected by IoT devices. The GAO identifies three major components that make up nearly all IoT devices: (1) hardware, (2) network connectivity, and (3) software. The hardware used in IoT devices generally consists of embedded components, such as sensors, actuators, and processors. Sensors generally collect information about the IoT environment, such as temperature or changes in motion. Actuators perform physical actions, such as unlocking a door. And processors serve as the “brains” of the IoT device. The network component of an IoT device connects it to other devices and to networked computer systems. And the software in IoT devices perform a range of functions, from basic to complex. These three components are common across the IoT industry, and serve as the bedrock foundation for understanding the security challenges facing the IoT space. According to the GAO, the benefits and uses of IoT for consumers, industry and the public sector are widespread. From wearable IoT devices, such as fitness trackers, smart watches and smart glasses, to smart homes, buildings and vehicles, IoT is changing the landscape of consumer products and how people interact with their space. IoT is also impacting supply chain and agriculture industries, enhancing productivity and efficiency. With these benefits comes potential risk. The GAO report identifies five risk categories presented by the onset of new IoT technology: (1) information security; (2) privacy; (3) safety; (4) standards; and (5) economic issues. Information security. The IoT brings the risks inherent in potentially unsecured information technology systems in homes, factories, and communities. IoT devices, networks, or the cloud servers where they store data can be compromised in a cyberattack. Privacy. Smart devices that monitor public spaces may collect information about individuals without their knowledge or consent. Safety. Researchers have demonstrated that IoT devices, such as connected automobiles and medical devices, can be hacked, potentially endangering the health and safety of their owners. Standards. IoT devices and systems must be able to communicate easily. Technical standards to enable this communication will need to be developed and implemented effectively. Economic issues. While impacts such as positive growth for industries that can use the IoT to reduce costs and provide better services is a beneficial outcome, economic disruption is also possible, such as the need for certain types of businesses and jobs that rely on individual interventions, including assembly line work or commercial vehicle deliveries. As IoT technology increases, so too will the regulatory landscape governing its use. Although there is no single US federal agency that has overall regulatory responsibility for IoT, various agencies oversee or regulate aspects of the IoT, such as specific sectors, types of devices, or data. If you or your business is operating, or plans to operate in the IoT space, the Dentons’ global Privacy and Cybersecurity group can help you navigate this fast-paced, and shifting environment.